Editor’s note: Eleanor Frost graduated from Charlotte Mason’s House of Education in 1912. Her senior portfolio was evaluated by Rev. Thorley who wrote, “A very excellent book, with beautiful Drawings. The notes are full of interest.” Less than six months after her graduation, she was invited to speak at the annual PNEU Conference in May, 1913. Her presentation was published as the article below. Her contribution was evidently well-received, as she was invited to speak again at the 1915 PNEU Conference. It is clear from this paper that Frost learned her lessons well. As a student of Miss Mason at the House of Education, she picked up and internalized the living ideas presented by her teacher and mentor. The paragraphs below are throbbing with Mason’s thought, but with the added gift of including very practical guidelines. It is this combination of principle and practice that makes this paper so valuable for us today. Before considering the practical details in which the Parents’ Union School endeavours to fulfil this ideal, it is necessary to state, however, shortly, some of the principles and aims on which the method is based. It is a fact that children by their very nature seem to have a particular aptitude for the things of God; their humility and simplicity, their delicate perceptions, make it easier for them to believe all that is wonderful, for as yet they have not experienced the materializing process that comes from contact with the world. Christ Himself, said, “Suffer the little children to come unto Me,” implying that, given the opportunity, they come; the word “suffer” is a plea to allow the children to come. Then, in St. Matthew, another reason for their particular fitness is given in the words, “their Angels do always behold the face of My Father which is in Heaven.” So direct and clear is the teaching in these and similar quotations that they need no comment, but explain at once the two fundamental principles, namely, Christ’s command and the children’s fitness. This latter seems to lie especially in their humility, for they are normally so unconscious of the ego, that to fix their eyes on what is outside themselves is both easy and natural, and here it is that they strike the very keynote of religion. It is objective, it is to seek the knowledge of God for Himself and for the joy of that Relationship, and as He is at the very heart and centre of each soul, a full and perfect life is the result. 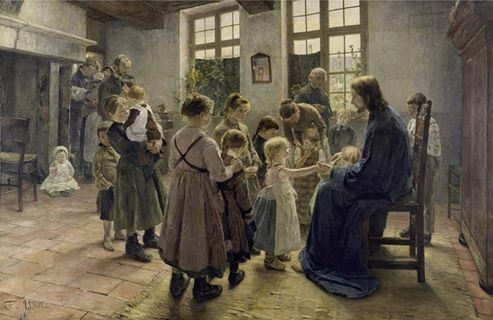 As we realize that the knowledge of God comes from ideas of God, it is necessary to ask “What ideas shall be given to the children?” First, perhaps, because easiest for their comprehension, is the idea of the Fatherhood of God, for through the tenderness of earthly parenthood they are able to realize something of His—the Father of the whole world. Next their loyalty is aroused by the thought of Christ the King to whom they may be true subjects; again, Christ the Hero, who having in His power all things, yet chose rather to endure hardships; and lastly, Christ the Saviour, to whom they will turn their thoughts outward after ill-doing, rather than inwards upon themselves. There is another thought to be given in this connection, namely, “the indwelling of the Holy Ghost” and from this springs the realization to the child that God is about his path and also of himself—that his body is the temple of the Holy Spirit. Too often God is presented as an Exactor and Punisher before His more obviously tender qualities have been made known, and thus the child learns to fear rather than to love, to avoid rather than approach. The Bible is the great storehouse of these ideas and it is there that the necessary and first hand knowledge is found, clothed in language that children readily understand and appreciate. This latter fact will be seen in the answers to some examination questions which will be read at the end, and which show also that they not only have the power of appropriating the words but also of imagining the scenes. Thus it is clear that to feed them on isolated texts is to starve them spiritually, and further, a knowledge of the context enables them in later years to form true judgments. The suitable parts of the Bible Stories, in the Bible words, are necessary for them and because some passages are undesirable, it is not allowable to deprive them of the Book entirely, for apart from its higher claims as a revelation of the Divine, it is a great literature, including biography, history, poetry, philosophy and ethics. Although the child nourished on these secondary ideas alone, must develop in character, yet the first claim of the establishment of the personal connection with the living God must be the aim ever uppermost in such teaching. It is this connection which has been called, “the hidden life and reality of religion,” and, I think, it is Coleridge who says also that “the Christian Faith is the perfection of intelligence.” But it is essential that the pupils work for themselves; they must be led to ponder, to meditate, and to reason, for it is true of the spiritual world as of the material, that, what is hardly earned is dearly prized—therefore with their minds must they labour. Again, how explain miracles? To teach Christ’s life and avoid them is an impossibility and also the very fundamental truths of the Incarnation, Atonement and Resurrection, are all miraculous; nevertheless, it is often said that “miracles are against natural law,” but may it not be that now we are only in touch with the circle nearest us, and of the great circles outside, the complete “Natural Law,” we are in utter ignorance, except for the glimpses we get through His works of exceeding might. “We are fooled by the eye, the ear. These introductory words give but a short account of the points which should be remembered in teaching the Bible; to enlarge on them would be but to curtail the description of the manner in which Bible lessons are taken in the different classes. Now, the direct aim in every class, of every Scripture lesson, is to give “new thoughts of God,” that at last the children may have a complete knowledge of His character and of the fact that He is an ever real Presence. To establish this end the teacher must give the pupils illuminating and helpful ideas and present them in such a way as to make them grasped as something precious and welcomed with eager joy. In this connection it is necessary to remember that the work must be progressive and that new ground must be broken each term, else there will be no progress in that Intimacy which is Life. Also from class to class there must be greater amplification, greater research, and this with the necessary books is shown in the following lessons. Last term in Classes Ia. and Ib., the Old Testament work included the friendship of David and Jonathan, and the first years of the former as King of Israel; it was founded on a certain number of “lessons” in Prophets and Kings of the “Bible for the Young,” with the corresponding Bible passages. A word must be said on the use of this book by Canon Paterson Smyth; generally, during her preparation the teacher must make its subject matter her own that it may come with all the greater force and spontaneity during the lesson. Let us take two scenes from this Old Testament friendship, not forgetting to emphasize the underlying idea of God. The preceding lesson would have been on the story of David and Goliath, therefore, the teacher begins by connecting that incident with to-day’s subject, and arousing their interest by a question perhaps on “Friend”; this word has a certain amount of everyday interest for all people, and used in connection with a Bible lesson it would attract the children’s attention at once. Then draw from them its meaning, viz., one who is attached to, or helps another; next picture Saul’s tent; the excitement of the Israelites; their joy; their animated talk; etc. ; then read I. Samuel, chapter 17, verses 57, 58, and chapter 18, verses 1 to 4. Next, get the children to narrate the whole incident as nearly as possible in the Bible words; then talk it over with them; how Jonathan denied himself for his friend; how they loved one another; for we read, that “the soul of Jonathan was knit with the soul of David”; but this short discussion must be absolutely objective, there must be no pointing of morals, for the children will “take” the lesson for themselves. Next read chapter 20, verses 24, 25, 27, 28, 29, part of 30, 31, and all 32 and 33, but this time, after the narration lead the children to picture the scene for themselves, and also encourage them to find evidence of the friendship, viz., Jonathan’s defence of David. At this point draw from them what this story shows us about God—how, looking lovingly down on His child David, He did not leave him desolate, but even in those outlaw days gave him a true friend to be both a comfort and support. From this they grasp the idea of God the Father watching over and caring for His children. The New Testament for last term included the teaching of the founding of Christ’s Kingdom and of the last journey to Jerusalem, from lessons in Canon Paterson Smyth’s “St. Matthew.” Take for instance, the lesson on “The man with the withered arm.” The teacher has two courses open to her, either to make the subject matter her own and so talk about it with the children after the corresponding Bible passage has been read and narrated, or, to read it to them directly from the book. The former is preferable in this case, because the teaching of how “the effort to obey brings the power,” is difficult and must be drawn from the children; but in cases when the teaching is very pointed and simple, it is well to read “The Bible for the Young” without comment, for all moral teaching apparently levelled directly at the children is a mistake, and this danger is avoided by an impersonal reading. In the foregoing lesson the idea exemplified by obedience to law is that of “Christ the King,” and this also must be drawn from the children. There is one more point in this lesson, the “Pictorial New Testament” is of great use, for even if Ib. children cannot read a little here and there they most thoroughly enjoy and appreciate the pictures. In Class II., the work is the same as in Class I., but necessarily amplified as the pupils are older. For instance, in the Old Testament they would sometimes write a short report instead of narrating, would follow the story of David’s wanderings with the map, perhaps making one and filling in the new places of refuge. The Bible passage is always read to them, and liberal use must also be made of the references; for instance, in reading that David could “Go no more home to his Father’s House,” read from an earlier chapter, and not tell only, as in Class I., about “His Father’s Sheep at Bethlehem.” This not only completes the picture, but familiarizes the children with the idea of the interest and fuller knowledge that comes from different points of view. In St. Matthew also, the procedure is the same as in Class I., with the exception that the children can read the Gospel Story themselves, and also do written reports. In this Class “Saints and Heroes” was set for additional reading. By the times the pupils have reached Class III., they should be able to bring a good deal of intellectual power to bear on their Bible Study, and therefore, they must be encouraged to exercise it. For the Old Testament “Prophets and Kings” was again used, but with one or two additional handbooks such as “The Work of the Prophets,” etc. The work included the stories of King Josiah and his three sons as told in the “Kings” and “Chronicles,” with all the related passages of the Prophet Jeremiah. Gradually, from the passages, referring to the Kings the Prophet takes life, and, helped by their Handbook with its illustrations, the pupils add to their knowledge the story of another type of Christ. Such a lesson would be arranged as follows: Let us take the story of Jehoiakim to-day, and by a brief recapitulation let the pupils connect it with the last lesson. Then let them read the passages referring to his reign in “Kings” and “Chronicles,” afterwards discussing them in the light of modern research and criticism, as shown in Canon Paterson Smyth’s book; tell each pupil to look up relative passages in the books of “Jeremiah” and “Lamentations”; read part of the chapter on “Jeremiah” in “The Works of the Prophets,” and lastly, sum up with one or two headings on the blackboard, and let the pupils write a report. Although, history and biography are prominent in such a lesson, yet the aim of “a new thought of God,” must be kept uppermost, and in this story it is found in the idea of a just God who hates sin and punishes it. By the time the children are in Class III., they have already received their first ideas about Christ, and so are ready to understand the love underlying this later and fuller development. In the New Testament, the work included part of Christ’s earthly life, and the manner of such a lesson would be as follows: The teacher prepares beforehand from St. John’s Gospel and either masters and remembers the explanations—the better plan—or else makes a few notes. As before, the lesson is connected with the previous one, and then the pupils read from the “Gospel History,” which is the Revised Version, arranged in chronological order. Discussion follows and explanation, the pupils being led to do as much as possible of this themselves. Next, to help them to picture the scenes, to feel and to think, the teacher reads the corresponding poem from Volume II. of The Saviour of the World. Lastly, the pupils write a report. Part of “Acts of the Apostles” was also taught last term with the help of the book of that name by E. M. Knox. Here again, there was great scope for much individual effort by the pupils, and also for the use of pictures and maps. This study was connected with the contemporary Roman, French, and English History, set for the term’s work. Lastly, in Class IV., the teacher’s work is not so much to teach as to direct; the pupils must search and strive for themselves; her office is to stimulate their thought, quicken their conscience and show them the way of personal study, that when the actual supervision of school days is over they may know how to continue Bible Study for themselves. Generally, they should read by themselves, but sometimes she will read with them. A lesson in this Class would be broadly on the following lines: a term’s work in the Old Testament would be on the “Book of Daniel,” to be studied with the help of J. R. Dummelow’s One Volume Commentary. The pupils would read a certain passage from the Bible, would be stimulated to try and explain it for themselves, then with the Commentary they would work through it again sentence by sentence, looking up the references, summing up the points, comparing the different Biblical accounts of the same incidents, and lastly, writing a report. It is thus that they get a real grasp of their subject, and it is in this study of God’s dealing with men of old that they are gradually coming to a more complete knowledge of Himself. The New Testament work was the chronological study of part of Christ’s earthly Ministry, and this was taken from The Gospel History, with the corresponding notes from each Gospel in the “Commentary.” For instance, suppose the lesson to be on the healing of Peter’s Wife’s Mother; the pupils would read the story in The Gospel History, then compare the accounts of this miracle in St. Matthew, St. Mark, and St. Luke, using the Notes in The One Volume Commentary, next they would read the corresponding poem in Volume II. of The Saviour of the World. Studying the Gospel stories thus, the pupils get the four points of view about Our Lord and also the illustrative poems which help them to think and feel. Part of the “Acts of the Apostles” was also studied in much the same way, viz. the reading of the Bible passages, the individual effort to understand fully, stimulated where necessary by the teacher, and then the study of the notes. There were also different books set for Sunday reading, The Saviour of the World, Stanley’s Sinai and Palestine, and Eastern Church. It cannot be urged too strongly that under every Bible lesson there must be the thought of the knowledge of God, whether it is actually face to face with Christ as in the Gospel story, or whether it is Christ as revealed by the Prophets; in either case He must come before the pupils as a real presence, the actual and living God. The teaching of the Catechism to serve God with all our heart, mind, soul, and strength, must be remembered, and the pupils led to feel with their heart, to labour with their mind to aspire with their soul and to bring these to fruition in serving God with all their strength; religion of one part only, if such an anomaly is possible, is a danger, for the whole nature is necessary to produce the Christian character. Finally, let us remember that it is a step by step progress without haste, yet without rest, in much Bible study, in wide reading and above all in quiet time for meditation, for, “The nurse of full grown Souls is solitude.” Thus, the children, fitted as we have seen, may not so much be brought back, as allowed to stay and grow in that Kingdom where there is grace and life abounding, and where looking to the King they may cry with the Psalmist of old that God is their exceeding joy. Editor’s Note: For advice on how to implement these ideas in a contemporary context, please follow this link. This article was originally entitled “Bible Teaching In The Parents’ Union School.” The formatting of the above article was optimized for online viewing. To access a version which is formatted more similarly to the original, and which includes the original page numbers, please click here. We are in a church which stresses very strongly the importance of catechism for children. The emphasis is to make sure that children are grounded accurately in theology. I am really struggling with it, because I realize that plenty of spiritual heavy weights in history have endorsed this method (including Martin Luther, I think), but it seems so stilted to me and I can’t help thinking that God himself chose to reveal his truth in stories and poems and metaphors, not neatly organized theological treatises. I completely agree that I want my children grounded in theology, but presumably Charlotte Mason’s students would have been so as well? Or is it as that CM worked at a time when there was a lot of theological consensus and therefore her students would have been more likely to absorb a biblical worldview from their culture, whereas our children are not. Would love to hear people’s thoughts. I hope this helps. I am interested to hear what others think!